When was the last time you worked with pointed back crystals? These amazing gems are perfect for embellishing furniture, clothing, jewelry and many more items. Best of all, when working with pointed back round stones, you gain the added advantage of using them in various ways. For instance, some of the unfoiled crystal round stones can be used upside down, giving a spike appearance. The smaller unfoiled crystals are popular in free floating crystal glass shaker jewelry, whereas the larger Round Stones can be easily set into empty cup chains for Sabika like necklaces, bracelets and earrings. Depending on your project, these stones are great for adding emphasis to a focal point of your choice. All stones available through us feature their own unique characteristics. For example, some incorporate sparkles that have a vintage mirrored look similar to Venetian Glass, while others have facets that come together in a dome shape, presenting a perfectly seamless stone. No matter the surface you want to embellish with Swarovski round stones, we have a color and cut that will be a perfect complement. You'll find inspiration comes in many forms, and in many projects, when working with Swarovski crystal round stones. For instance, it’s both simple and fun to make your own jewelry, especially when you realize how many stones are available. Setting stones into empty cup chains is as simple as placing the stones into the cup chains and folding over the prongs with a butter knife. The crystal stones can also easily be glued into pre-cast molds for a quick and secure method. No matter your project, we have the stones and colors you need to make it complete. Some people like making pendant necklaces with Swarovski round crystals. While others like to add small accents to jewelry and watches. It doesn't matter what the project is you’re going to accomplish. Any combination of round stones or pointed back crystals, which are the Fancy Stones, they can easily be incorporated to add a personalized touch. Swarvoski crystal stones are becoming more and more popular. Celebrities commonly wear them, and they have even been sewn onto Queen Elizabeth's clothing. These stones are a great way to make a statement because they have such optimal clarity and sparkle. 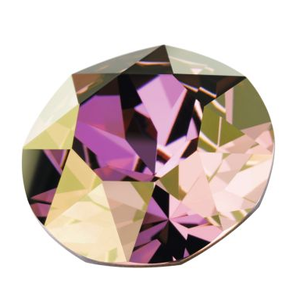 Swarovski round stones have been cut to perfection, ensuring their true beauty shows through from each angle. At Rainbows of Light, all of our gems are sure to exceed your expectations. By looking through our collection of gems, you’ll find inspiration for making truly unique jewelry and embellishment designs for home décor items, clothing, accessories and more. Even if you find a stone in a color you want but not the correct size, let us know, we can order anything Swarovski makes and we are happy to explore all options for you. Shop our website today and add a sparkling touch to a variety of items in your life.